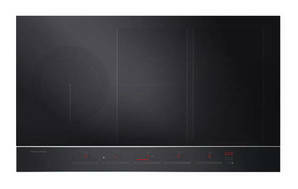 Snapshot: The Fisher & Paykel CI905DTB3 induction cooktop has 5 cooking zones, which can be used as 2 flexi-zones. How well does it cook? Excellent results in our white sauce test. Excellent results in our rice test. Has 5 large cooking zones (that can be used as 2 flexi-zones). Very good cooking zone layout (4 cooking zones the same size and 1 dual-zone which has two different sized heat rings). Accommodates all cooking zones at the same time. Gentle heat setting ideal for melting chocolate. Medium heat setting for keeping food warm and warming delicate foods. May not have even heat distribution when using flexi-zones. May be difficult for larger fingers to change heat setting. No numbers displayed for heat settings. Cooktop may require more power than a typical installation may supply.